The buzz of explainer videos is gaining momentum. According to recent statistics, “About 95% of people trust explainer videos to learn about a new product or service. Furthermore, explainer videos have convinced about 81% of people to buy a product or service. Whoa, such a big number! What does make an explainer video special in the world of marketing? They are short, to the point, and full of graphics which introduces a viewer to a particular brand. The impact of a short video is significant as compared to lengthy white papers, which is why explainer videos are trending in the realm of digital marketing. Today, most marketing experts take advantage of these videos to raise a bar and get a big chunk of their target audiences. If you have just decided to invest in explainer videos, consider the ideas mentioned below to make the worth of it. A deep understanding of target audience paves the way for a successful marketing campaign. What are The major characteristics of your target audience? Acknowledging the ins and outs of your target audience will help generate a blueprint of your video. Moreover, you will get to know what tone your video should have to keep the flair of your brand. I mean whether it should be decent or full of fun. This understanding will give a clear picture associated with design, script, images, colors, voice over, etc. The success of your video depends on how skillfully you highlight the pain points of your customer in 60 to 90 seconds while offering a suitable solution to them. This plays a major role in decision making of a customer. If a video portrays your services as one size fits all, a viewer is likely to make an instant purchase. A script decides whether a viewer will stay or buzz off. Moreover, it is responsible for accentuating the other features of a video like a voiceover, colors, etc. Usually, companies get it written from an “outsider”. Go for someone who can align with your perspective and goals, and explain it in a way that it appeals to your audience. Many professional video companies might ask you to fill a creative brief first. As you will dig deep into your protocols, investment, and other aspects that matter to you, you will be defining the better version of your company in a creative brief. This exercise is important prior to video making as it ensures that you won’t divert from your end goal of turning visitors into buyers. After this brainstorming process, start writing a script in accordance with your creative brief that will help you stay on track. Explainer videos are not run-of-the-mill videos as it has much to offer. Start-ups consider it a marketing tool, so they are oriented towards their target audience with a clear business goal. Simply, they focus on marketing. How far your video has contributed to achieving your marketing objective is important to consider when deploying an explainer video as their marketing tool. It should worth the investment you have done. You can check the metrics of your video, such as viewership, bounce rate, and conversions through online tools available with which you can calculate their contribution to your marketing efforts. Based on the metrics, you would be able to plan your future investment and sale as well. Where are you going to market it? Just making a video and going it live won’t make a difference. If you have a super cool, engaging, informative and helpful video in your satchel, but still it is not able to raise the number of conversions, then you are seriously missing out on something. The idea is you need to make it visible to your audience as it won’t walk to your audience on its own. Here comes the role of SEO. A good SEO campaign consists of keywords, titles, meta description, thumbnail, categories, tags, social media strategy, ad campaigns etc. which help your video reach out to a maximum number of viewers. If you have been into marketing, then you may have heard of “content marketing,” and “product marketing”. Both of them have different meanings. When marketing involves sales funnels and commercials to convince the customer to make a purchase, it is called product marketing. On the other hand, content marketing is a broader term as it includes commercialization of a variety of content for information or education. Its purpose can be to sell, but the prime focus of content marketing is to deliver the information that helps a target audience know more about a product or how it works. If your end goal is to sell, then keep it subtle so that it conveys a helping message rather than a desire to increase sales. 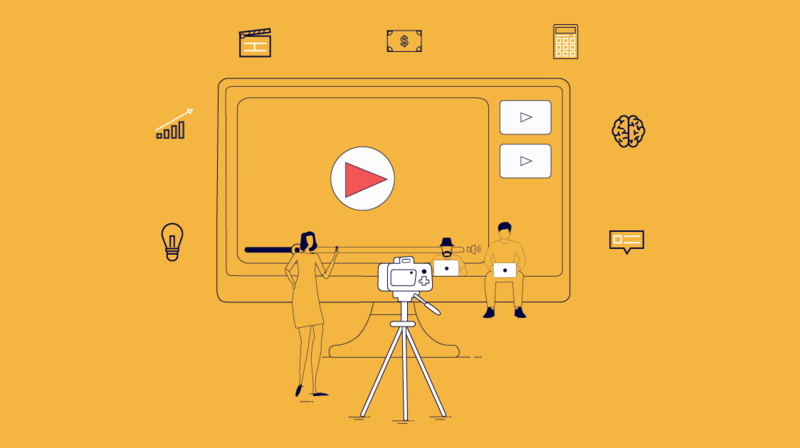 In the marketing world, like other techniques, explainer video production process needs the involvement of a client and company. From requirements to investments, a lot of things need to be discussed to meet personal and professional preferences. Initially, the process might sound complex, but the right strategy in place can make it interesting with new ideas implementing every day. The synchronization in all steps ensures consistency throughout video making and in a good final product. This depends on the experience of a service provider in delivering innovative explainer videos to attract new visitors, diversify your content and give an edge to your website among your competitors. I hope this post has motivated you on the grounds of investment you are going to make in explainer videos. Chehak Wadhwa is a leader in the world of animation, with a handful of experience in designing infographics, brochures, featured images, and Explainer Videos. Creative by nature, she helps companies attain leads and enjoy better cash flow through explainer videos that pinpoint prospect's problems and present their services as a one stop solution.